They are terrible when they are not implemented the right way. They are terrible when companies don’t appreciate that all of these magical applications are nothing but databases and don’t put the right processes in place to ensure that all interactions are entered into this database so that the data can be properly used for further sales, marketing and service interactions. They are terrible when companies don’t assign strong administrators, or cut corners on training or try to do too much at one time. They are terrible when senior managers don’t pay the attention needed to make these systems successful and instead cave in to the complaints made by lower level employees who don’t want to do the extra work. These applications are terrible when managers don’t insist on the reports they should be using, don’t enforce rules for entering new opportunities and don’t commit to long-term, consistent and repetitive drip-marketing and communication campaigns using the information maintained by their CRM system to keep their prospects informed and their customers close. Yes, these CRM systems are terrible. As terrible as an automatic rifle given to a child or a nine-iron handed to a monkey. But placed in the right hands, like a soldier or a professional golfer, a CRM system (like the popular ones listed above) can be a powerful tool for growing a company’s profits and increasing its value. So is your CRM system terrible? Or is it you? For a CRM project to be successful it takes diligent planning coupled with smart implementation. You can’t wing it. Keep in mind, CRM is never a one-shot implementation. Ongoing management and tweaking is required. 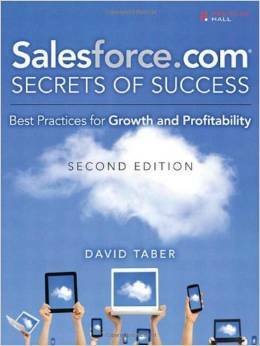 If you are considering Salesforce for your company, you owe it to yourself and your company to at least read the Executive Summary chapter from Salesforce.com Secrets of Success: Best Practices for Growth and Profitability (2nd Edition) by David Taber. Together with its companion website (SFDC-secrets.com), you find questionnaires, worksheets, templates, checklists, and other resources for every executive, team member, developer, and stakeholder.